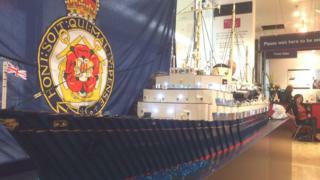 A Lego replica model of the Queen's former floating palace, The Royal Yacht Britannia, is to be unveiled at the five-star attraction in Leith. Created using 40,000 Lego bricks, and measuring more than 11ft (3m), the 1:37 scale model will go on display at Britannia's visitor centre on Saturday. It has been designed and constructed from Britannia's original drawings. It took Lego model builder and fisherman, Jim McDonough, 51, five weeks to create. He built the ship on the dining room table in his home near Arbroath and said there was no glue used in its construction. He said everything could be taken apart. The replica has the onboard Phantom V Rolls-Royce in its garage and the white Baby Grand Piano in Britannia's Royal deck tea room. Bob Downie, Britannia's chief executive, said; "We are thrilled with our Lego Britannia. "Jim has produced an outstanding replica model of the ship which will be on display during the Queen's 90th birthday year and this unique piece is sure to be a highlight for Lego fans, young and old." Mr McDonough, said: "It was an honour to be asked to build The Royal Yacht Britannia, and it's one of the most exciting projects I've ever undertaken, and being able to refer to the original plans, kindly supplied by Britannia, allowed me to produce this replica of Her Majesty's yacht." The Royal Yacht Britannia was home to the Queen and the Royal family for more than 40 years and sailed more than a million miles around the world. Britannia has held the accolade of being Scotland's Best Visitor Attraction for 10 years in a row and in TripAdvisor's top three UK landmark attractions for two years.